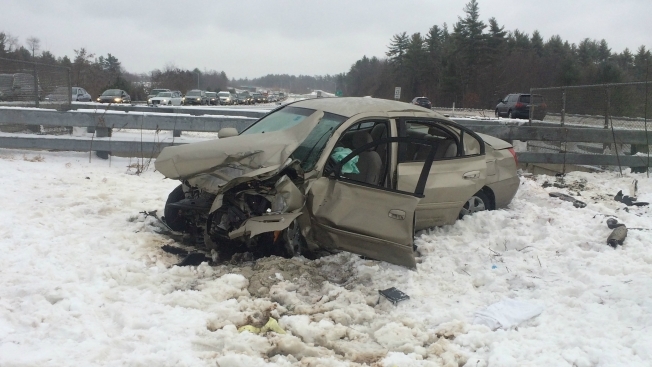 One person was killed in a crash in Exeter, New Hampshire, on Wednesday. One person was killed in a single-vehicle crash in New Hampshire on Wednesday, according to state police. Janelle Jordan, 26, of Newmarket, was traveling east on Route 101 when her 2006 Hyundai Elantra went off the left side of the road and struck the guardrail. The vehicle then went airborne and collided with a second guardrail over the access road to the Conner Farm Wildlife Management Area before coming to rest in the median. Jordan was pronounced dead at the scene. The cause of the crash remains under investigation. Police said they are looking into a report that Jordan may have been speeding and using a cell phone at the time of the crash. The New Hampshire Department of Transportation said the left lane was closed on Route 101 west and eastbound by Exit 9 around 11:30 am. as a result of the crash. All lanes reopened at 1:20 p.m.